Military arrests. Drs B. A. Daughterty, George Stubblefield and R.S. McKaig and family, W.O. Sprigg, Esq. and family and Mrs. W.W. McKaig and family were last week arrested by the military authorities here. Drs. McKaig, Stubblefield and Daugherty were sent to the military prison at Wheeling, Va., and Wm. O. Sprigg and family, Mrs. Wm. 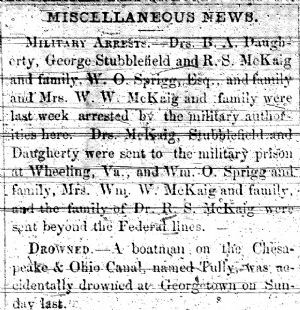 W. McKaig and family, and the family of Dr. R. S. McKaig were sent beyond the Federal lines. Drowned. A boatman on the Chesapeake and Ohio Canal, named Tully, was accidentally drowned at Georgetown on Sunday last.